Melinda Leslie is a researcher, investigator, and lecturer in the field of Ufology. She has been public with her own abduction experiences for over 20 years, researched covert-ops and military involvement in abductions (also known as MILABs) for 18 years, and interviewed over 80 abductees with this involvement. Melinda's research is featured in the book; Camouflage Through Limited Disclosure: Deconstructing a Cover-up of the Extraterrestrial Presence by Randy Koppang. Melinda has lectured for numerous organizations including MUFON, the X-Conference, the Bay Area UFO Expo, UFO Expo West, the International UFO Congress, The Whole Life Expo, and more. She has been a guest on numerous popular radio shows including Coast-to-Coast AM, and appeared on several television shows. 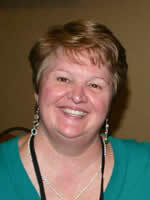 For 9 years Melinda was the Producer and Director of a UFO lecture series hosting the most prominent names in ufology. In addition to her abduction work, Melinda has been a paranormal researcher for over 25 years and a founding member of the Orange County Paranormal Researchers, a group which has conducted formal investigations for 9 years. Melinda Leslie is a researcher and investigator in the field of Ufology with over 27 years of experience. For five years she has been the Owner of UFO Sighting Tours in Sedona, Arizona, where she has conducted nearly 600 tours with the use of military Night Vision Goggles. To date, Melinda’s clients have felt they always had true UFO sightings on every tour but one! Please see her website UFOSightingTours.com for information and her client testimonials on TripAdvisor.com. Melinda is a UFO abductee and has been public with her own extraterrestrial and covert-ops human abduction experiences for 25 years and has researched a military and intelligence agency involvement in UFO abduction cases for 24 years. Both her research and personal experiences have been featured in 19 books by prominent authors in ufology. Melinda also has a deeply personal connection to Joshua Tree and the surrounding area because her first ET abduction experiences as a young child took place while visiting family right next door in Landers, Yucca Valley, home of the famous Giant Rock! For additional information about Melinda’s abduction experiences and research please see the videos below. Melinda has lectured for numerous organizations including MUFON, the X-Conference, the International UFO Congress, UFO Con, the Bay Area UFO Expo, UFO Expo West, The Whole Life Expo, and more. She’s also a frequent guest on numerous radio shows including as a repeat guest on Coast to Coast AM, and appeared on several television shows including a soon to air appearance on Beyond Belief with George Noory.